with our audiences and visit afterwards with the residents. Added three programs: God Bless America, Just for the Fun of It and Tickling the Funny Bone. January–After a brief hiatus, TTT has resumed with a new program called “Winter Wonderland.” Helen Esposito, Janice Zinicola, Art Moscatello and Ina Mayer were warmly received at Caton Merchant House. 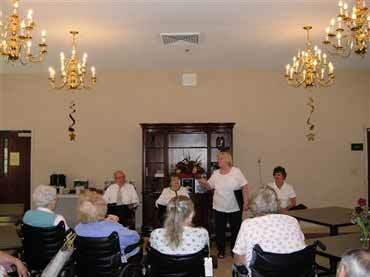 May 2007 at the Gainesville Nursing & Rehabilitation Facility–performed Just for the Fun of It. This was the TTT’s debut with Joyce Mancini, Grace and Ed Baier and Carol Katchmark performing. They were asked to return with other programs. August 8 and 15—The Summertime Program was performed.